Many brick-and-mortar stores have already gone bankrupt, or migrated their operations online. Massive change is occurring in this arena. All one needs to do is look at the following table to understand the massive upheaval afoot. For those “real-life-stores” that survive, an evolution is taking place from a product-centric mentality to an experience-based business model by leveraging AI, VR/AR, and 3D printing. These 4.2 billion new digital consumers will begin buying things online, a potential bonanza for the e-commerce world. At the same time, entrepreneurs seeking to service these 4-billion+ new consumers can now skip the costly steps of procuring retail space and hiring sales clerks. Today, thanks to global connectivity, contract production, and turnkey pack-and-ship logistics, an entrepreneur can go from an idea to building and scaling a multimillion-dollar businesses from anywhere in the world in record time. 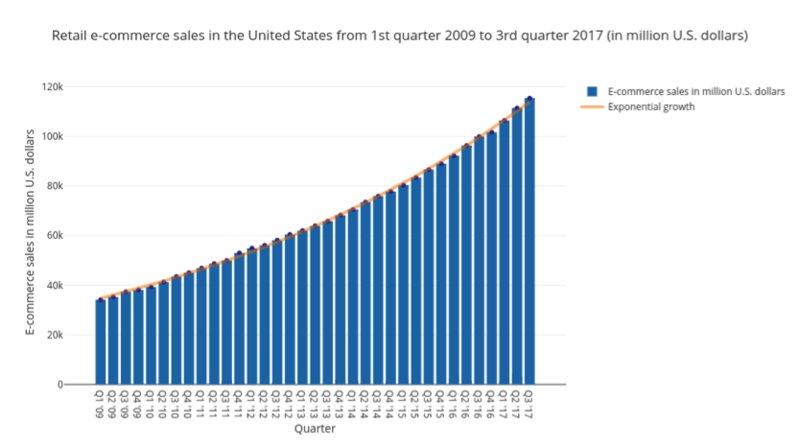 And while e-commerce sales have been exploding (growing from $34 billion in Q1-2009 to $115 billion in Q3-2017), e-commerce only accounted for 10 percent of total retail sales in 2017. In 2016, global online sales totaled $1.8 trillion. Remarkably, this $1.8 trillion was spent by only 1.5 billion people – a mere 20 percent of Earth’s global population that year. There’s plenty more room for digital disruption. AI will demonetize e-commerce operations with automated customer service, ultra-accurate supply chain modeling, marketing content generation and advertising. AI-Customer Services: Imagine an AI that is trained by every customer interaction, learns how to answer any consumer question perfectly, and offers feedback to product designers and company owners as a result. Facebook’s Handover Protocol allows live customer service representatives and language-learning bots to work within the same Facebook Messenger conversation. Taking it one step further, imagine an AI that is empathic to a consumer’s frustration, that can take any amount of abuse and come back with a smile every time. As one example, meet Ava. "Ava is a virtual customer service agent, to bring a whole new level of personalization and brand experience to that customer experience on a day-to-day basis," says Greg Cross, CEO of Ava’s creator, an Austrian company called Soul Machines. Optimized Supply-Chain: Predictive modeling and machine learning are also optimizing product ordering and the supply chain process. For example, Skubana, a platform for online sellers, leverages data analytics to provide entrepreneurs constant product performance feedback and maintain optimal warehouse stock levels. Blockchain is set to follow suit in the retail space. ShipChain and Ambrosus plan to introduce transparency and trust into shipping and production, further reducing costs for entrepreneurs and consumers. Personal shopping assistants are shifting the psychology of the standard shopping experience. Amazon’s Alexa marks an important user interface moment in this regard. Alexa is in her infancy with voice search and vocal controls for smart homes. Already, Amazon’s Alexa users, on average, spent more on Amazon.com when purchasing than standard Amazon Prime customers -- $1,700 versus $1,400. As I’ve discussed in previous blogs, the future combination of virtual reality shopping, coupled with a personalized, AI-enabled fashion advisor will make finding, selecting and ordering products fast and painless for consumers. Imagine a future in which your personal AI shopper knows your desires better than you do. Possible? I think so. After all, our future AI’s will follow us, watch us, and observe our interactions -- including how long we glance at objects, our facial expressions and much more. In this future world of AI-enabled shopping, one of the most disruptive implications is that advertising is now dead. In a world where an AI is buying my stuff, and I’m no longer in the decision loop, why would a big brand ever waste money on a Super Bowl advertisement? The dematerialization, demonetization and democratization of personalized shopping has only just begun. In 2017, over 6,700 brick-and-mortar stores closed their doors, surpassing the former record year for store closures set in 2008 during the financial crisis. Regardless, business is still booming. As shoppers seek the convenience of online shopping, brick-and-mortar stores are tapping into the power of the experience economy. Rather than focusing on the practicality of the products they buy, consumers are instead seeking out the experience of going shopping. The Internet of Things, artificial intelligence, and computation are exponentially improving the in-person consumer experience. As AI dominates curated online shopping, AI and data analytics tools are also empowering “in-real-life” store owners to optimize staffing, marketing strategies, customer relationship management and inventory logistics. In the short term: retail store locations will serve as the next big user interface for production 3D printing (custom 3D printed clothes at the Ministry of Supply), virtual and augmented reality (DIY skills clinics), and the Internet of Things (checkout-less shopping). In the long term: we’ll see how our desire for enhanced productivity and seamless consumption balances with our preference for enjoyable in-real-life consumer experiences — all of which will be driven by exponential technologies. One thing is for certain: the nominal shopping experience is on the verge of a major transformation. Twenty years ago, Amazon showed us how the web could offer each of us the long tail of available reading material, and since then, the world of e-commerce has exploded. And yet we still haven’t experienced the cost savings coming our way from drone delivery, the Internet of Things, tokenized ecosystems, the impact of truly powerful AI, or even the other major applications for 3D printing and AR/VR. Perhaps nothing will be more transformed than today’s $20 trillion retail sector. Hold on, stay tuned and get your AI-enabled cryptocurrency ready. 1.A360 Executive Mastermind: This is the sort of conversation I explore at my Executive Mastermind group called Abundance 360. The program is highly selective, for 360 abundance and exponentially minded CEOs (running $10M to $10B companies). If you’d like to be considered, apply here.